Girls Rock! Chicago is proud to support, protect, and uplift transgender youth in all of our programs. If you are wondering what you can do to support trans youth in light of the rescinded guidance on Title IX, there are many actions that you can take. There is much that could be said about this topic, and this list is in no way comprehensive, but we hope that you will find it to be a good starting point. 1. Reach out to the trans people you love. Make sure they know that they are loved and valued, and that you will continue to fight for them. For many of us, this is a scary time. Our safety is being threatened in a systematic way, and people in our communities are feeling emboldened to commit hate crimes against us. Though this is not to suggest that we were in a utopian period of trans safety before this moment. 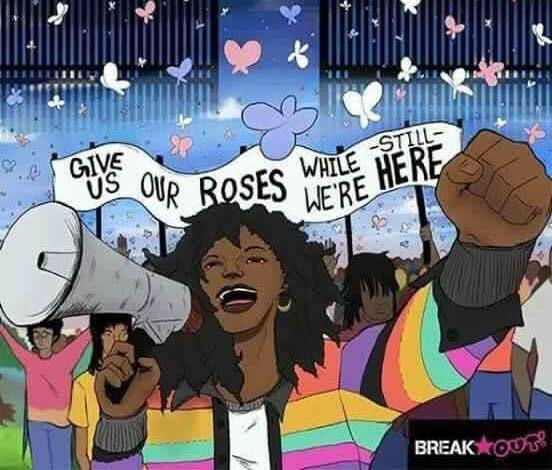 Never forget that trans people, especially trans feminine people of color, face devastating amounts violence in the US. 2. Protect and uplift trans people. Think about what you can do with your relative privilege to make your community safer for trans people, especially trans youth. Can you advocate for an inclusion policy at your workplace or school? Your friends may be safer using the bathroom in public with an advocate to look out for them. (Even small gestures can be powerful–one of my cis friends scoped out a barber shop for me, making sure that the staff wouldn’t give me a hard time before I tried it!) Also, make sure that you are inviting us to participate in conversations about our rights, our well-being, and what we want and need. Protect, but don’t speak for us. 3. Call your legislators. There are a lot of different calls you make on this issue. Here are some tips for calling legislators/people in political offices in general, and here are some tips for folks with social anxiety. – Call your legislators and demand protection for transgender students. – Encourage your friends across the country to call on this issue. – It is still important to call even if you know that your representatives already agree with you. Thank them for their work, and know that the volume of calls they receive can be persuasive. 4. Run for something.Don’t like what your legislators have to say? Run against them. Consider running for the school board. Check out Run for Something to demystify the process. 5. Get familiar with the issues facing trans people. Learn about what it means to be transgender or gender nonconforming and about the struggles we face in our daily lives. Disproportionate rates of violence and suicide are among them. Empathize and become more articulate and knowledgeable in your fight for trans rights. – Trump and Transgender Rights: What Just Happened? 6. Read about trans history. Trans people aren’t a new phenomenon, though we are currently much more visible in the media. Check out Leslie Feinberg’s Transgender Warriors or Susan Stryker’s Transgender History to read about trans people throughout history and across cultures. 7. Get legal help if you or someone you know is being discriminated against. Lambda Legal, the ACLU, and many other organizations can provide advice and help you file a lawsuit. 8. Get help in a crisis. If you or someone you know is in trouble, reach out to the Trevor Project, Crisis Text Line, Trans Lifeline, or the Suicide Prevention Lifeline. 9. Donate to or volunteer with a cause that resonates with you. Follow your heart, but consider smaller organizations that aren’t getting national attention right now but still need funding to provide services directly to trans people (especially those with trans folks in leadership positions). Trans Lifeline, Black & Pink, RAD Remedy, Chicago Women’s Health Center and Girls Rock! Chicago are all working to protect and uplift trans people right now. A small donation can have a big impact at an organization with a relatively low budget.